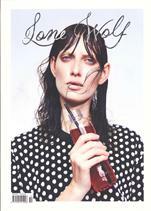 Lone Wolf Magazine is a quarterly fashion publication for intelligent, creative women. We are based in San Francisco, printed in the UK and distributed all over the world. Lone Wolf caters to the artists, business women, creative freelancers, and dreamers hungry for quality content and inspiration. We are a new breed of style publication that feels more like a story-book than a shopping list. Lone Wolf strives to create a refuge for creative fashionistas, to clear the clutter you often find in the fashion magazine world, and offer a curated, positive and enlightening reading experience for intelligent women.